Dickson, a leader and one of the longest family owned street sweeping companies has experienced first-hand the evolution of street sweeping technology for over 65 years. 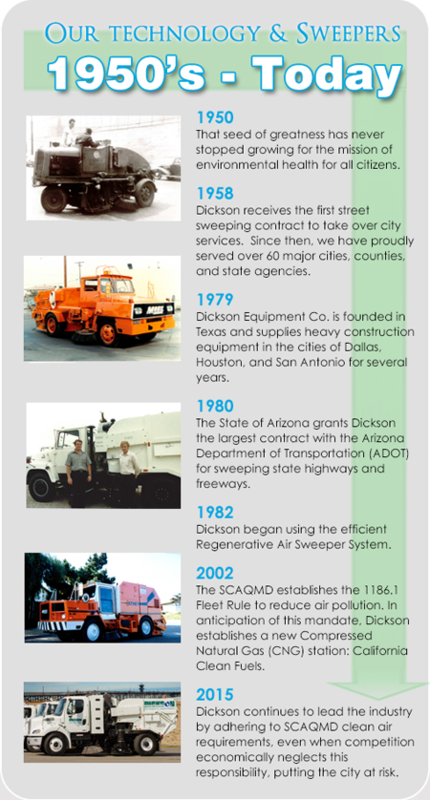 Below is their pictorial history of their Street Sweepers. 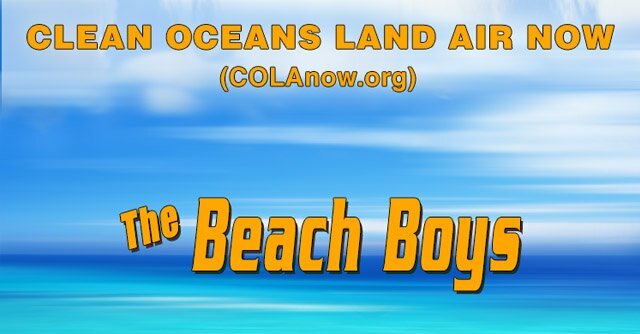 The goal of simple debris removal changed the 1970’s, when policymakers begun to reflect concern for water quality. In the United States, the Stormwater-runoff Report of 1998 rang an alarm indicating that older street sweepers were not effective in removing large particles of road debris. Small particles of debris remained behind in large quantities. The remaining debris was not seen as an aesthetic issue because rain would wash them away. Today, small particles are known to carry a substantial portion of the stormwater pollutant load. By removing these particles and debris, Street sweeping can be an effective measure in reducing pollutants in stormwater-runoff. 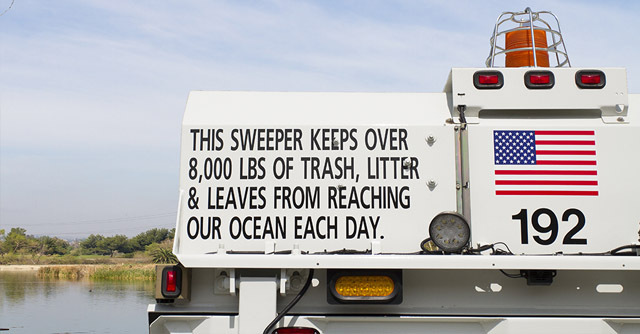 The Environmental Protection Agency (EPA) considers street sweeping a Best Management Practice in protecting our environment, air and water quality. Regenerative municipal air street sweepers are capable of collecting small particles of debris and outperform the mechanical broom type street sweeper. The less effective mechanical broom sweepers account for the greater majority of all street sweepers used in the United States today. A regenerative air street sweeper uses forced air to create a swirling effect inside a contained sweeping head and then uses the negative pressure on the suction side to place the road debris inside a hopper. Debris is removed from the air by centrifugal separation and reused, keeping particulate matter inside the hopper.